Kenna Fisher is the manuscripts cataloger at The Bancroft Library. But another apt title might be treasure hunter. 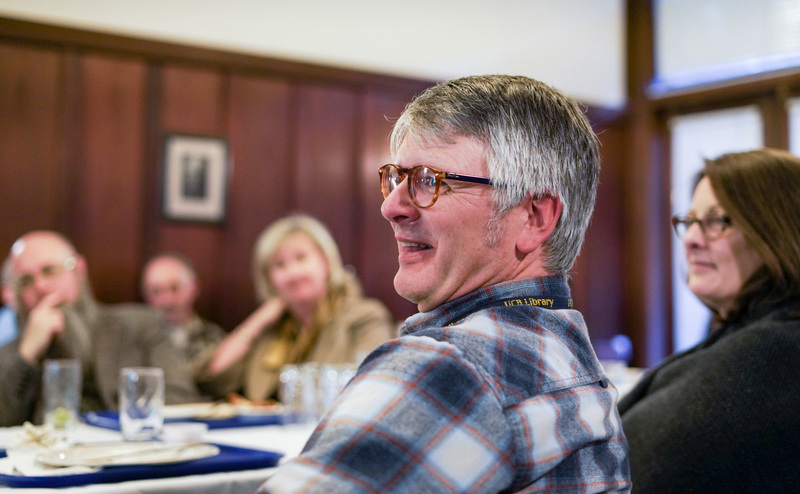 At a lunchtime roundtable on Thursday, Fisher took audience members behind the scenes of the fifth floor of Bancroft, where rare materials are investigated and their secrets unturned. 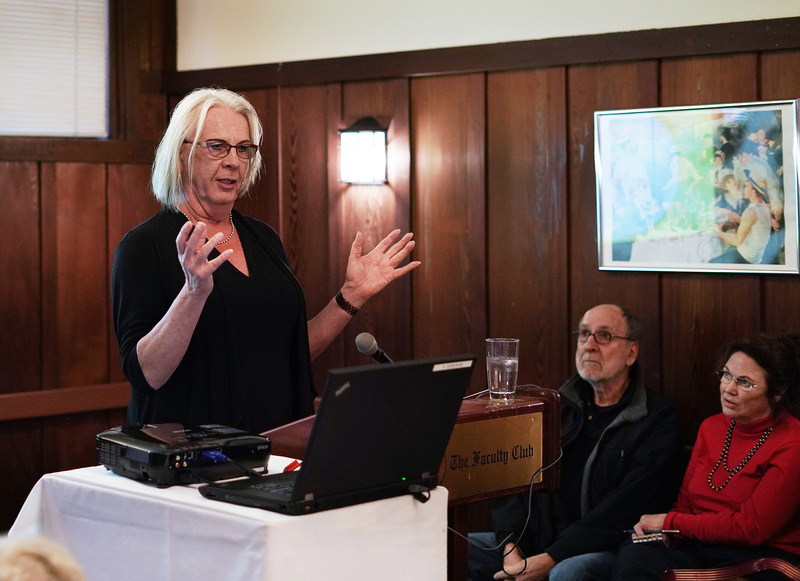 The talk, called “Solving Mysteries at The Bancroft Library: The Fifth (Floor) Dimension,” attracted an eclectic mix of community members, professors, and Library staff, who gathered in the Faculty Club’s Lewis-Latimer Room, filling every chair. Last year, Fisher received a journal — one of many that have crossed her desk over the years. But this one stood out: It wasn’t just a diary, but a “Ship Capitol’s Log Book.” The journal tells the story of a passenger aboard one of the earliest ships to sail for California during the Gold Rush, arriving in San Francisco in July 1849. It’s full of ornate drawings of large ships and harbors, along with song lyrics by other passengers. And, on top of all that, a mystery: The signature on the “property of” inscription was not entirely legible, and it did not match the handwriting in the rest of the journal. The vendor who sold the journal had told Fisher they didn’t know who wrote it. The inscription included two unclear initials and the last name Maraspin, the year 1917, and an address in Massachusetts. From that alone — with the help of Google and Ancestry.com — Fisher was able to track down the mystery identities. Paul Maraspin had authored the journal, and Francis Lothrop Maraspin (F.L. Maraspin) — his son — had signed it 68 years later. The address on the journal — 117 Court St., Boston, Massachusetts — exactly matched the address given by Francis Maraspin on a Sons of the American Revolution application form from 1935. Attendees include, left to right, acquisitions assistant Rachel Lee, map metadata and curatorial specialist Heiko Mühr, and curator José Adrián Barragán-Álvarez. Then, by checking passenger lists from the voyage, she tracked down the name of the journal’s illustrator — using just the initials scribbled in the corner of the drawings. Fisher also shared her experience unpacking rare materials belonging to Dr. Raymond Arthur Babcock, who was captain of the Masonic Ambulance Corps in the 91st Division of the United States Army during World War I. After the war, Babcock returned to Willits, where he became the beloved country doctor known for driving his Buick to his patients’ homes as far up the hills as it would go and then trekking through mud the rest of the way. Babcock, like Maraspin, kept a remarkable diary, full of not only WWI stories, but also notes on medical cases and instructions on how to set up field hospitals. The materials in Bancroft also include a canteen engraved by a cartoonist who served with Babcock, and a locket containing Babcock’s Mason membership information. Among the trinkets was what looked like a strange pair of brass scissors, with a rectangular bulge on the handle and a curved tip. Fisher guessed that it was a medical object, perhaps, but an audience member spoke up, solving the mystery. “That’s a candle snuffer, isn’t it? We have one in our house from the 1920s,” he said. 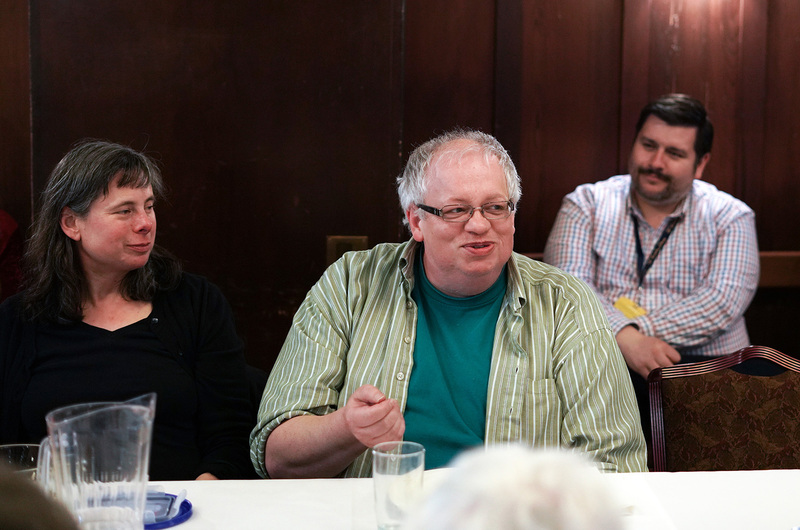 Randal Brandt, head of cataloging at Bancroft, comments at the lunchtime event. By making collections publicly available, though, the Library can crowdsource its puzzles to the community, collecting invaluable tidbits from unexpected places. At The Bancroft Library, visitors can fill out a form to further enlighten curators about material they come across. Judy Nakadegawa, a Berkeley resident who often attends the roundtables, said she appreciated the diverse gathering of community and staff members. She found Thursday’s roundtable especially compelling. “Even if it’s a specific subject that I think I don’t have a particular interest in, the talk is always interesting,” she said. From big books to bones: What are librarians' favorite treasures?